One day back in 2004, Kirsten Cummings just happened to be walking through the Mission Valley YMCA gym where she works out and saw a team of older women playing basketball. Or, to put it a little more accurately, they saw her . “As soon as I walked in, the first question they asked me was, ‘How old are you?’ I kind of laughed….I told them I was 42 and they were so disappointed (that she wasn’t old enough to play with them.) I’m 6-4, so that’s why,” Kirsten recalls. Kirsten had a lot to offer the ladies. She not only played professionally in Europe, Japan, and Israel for 14 years, but she starred at Long Beach State back in the 1980s. She was coaching at a local community college at the time, but after a season of coaching the senior women, she decided to devote herself to the cause of senior women’s basketball fulltime. Almost 10 years later, Kirsten is still ineligible to play senior basketball herself. She is over 50 now, but the rules say that you must wait 20 years to play in the Nationals if you played professionally. 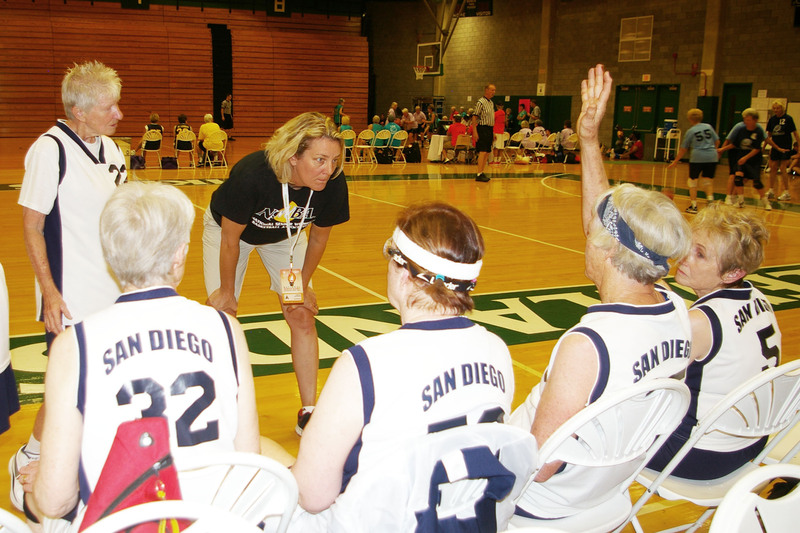 Nonetheless, when the National Senior Games commence in Cleveland in two weeks, Kirsten or Coach K as her players call her, will be plenty busy. She’ll be on the sidelines coaching that same team that solicited her help almost 10 years ago. (The San Diego Splash, which now competes rather successfully in the 80+ division even though all but one of their team members is over 85. What attracted Kirsten to the senior group – and keeps her committed to them — is the fact that the senior crowd isn’t just out there for some recreation. They’re either reliving the golden days of youth, or making up for lost time because their opportunities were so limited in the 1950s and 60s. 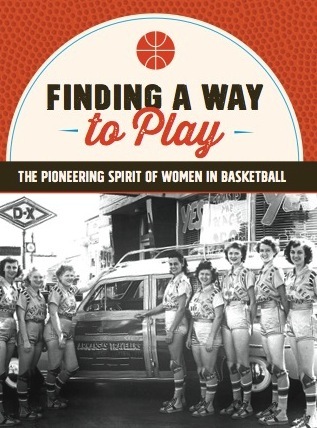 Kirsten is so devoted to senior women’s basketball that she started a nonprofit clearinghouse, the National Senior Women’s Basketball Association, in 2008. The organization is strong in the San Diego area, but slowly growing beyond it to other regions of the country. 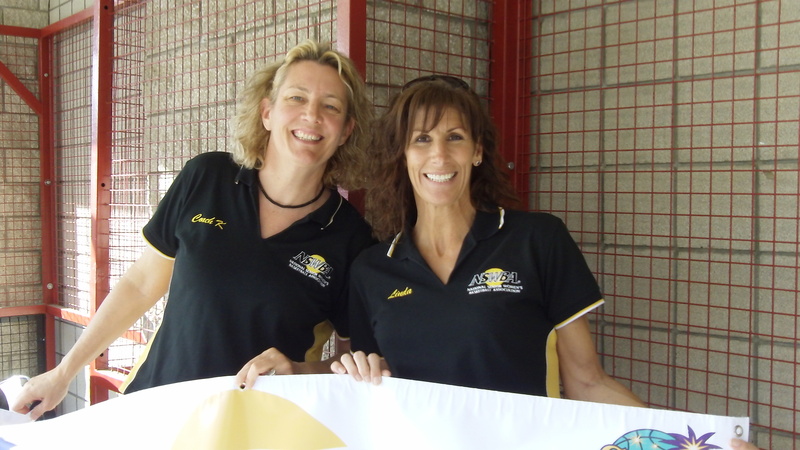 That’s Kirsten on the left in the photo, with a member of the NSWBA board, Linda Cord. Check out their website to learn more about the group. What an interesting post. Can’t wait to find out how they do in the Nationals! Beautiful blog – even if I’m seeing this for the first time. I don’t do Twitter much. Thank you Jo for a wonderful blog. My passion continues. Hope to see you in Minneapolis!